The opening words of Jesus' most famous recorded sermon, "The Sermon on the Mount," (Matthew Chapter 5) are often known as The Beatitudes. These words have inspired and challenged countless people over the centuries. 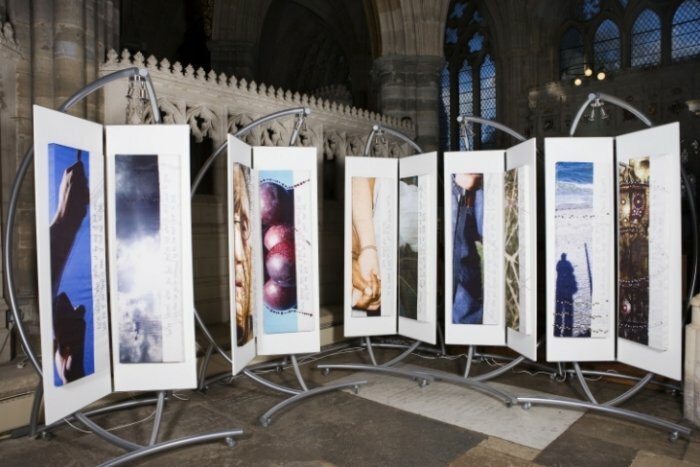 These ten screens each look at the Beatitudes in terms of "peace": "personal peace"; "peace in relationships"; "peace worldwide" and underpinning all these "peace with God". Because the concept of peace is concerned with people and their response to God most of the photographs used on the screens are of people. The slideshow below shows each of the screens in order. Click here to view a presentation of this exhibition. Click here to download an explanatory leaflet.